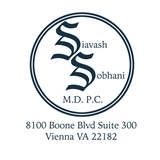 Siavash Sobhani MD PC (Vienna) - Book Appointment Online! ****PLEASE PROVIDE THE OFFICE WITH A 24 HOUR NOTICE FOR ANY CANCELLATIONS OR RESCHEDULES! **** Dr Sobhani began practicing medicine in 1994 and established Siavash Sobhani MD PC in 1997 where he has been thriving in private practice and caring for a multitude of diverse patients. He is fluent in English, Farsi and is proficient in French, Spanish and Arabic. Dr Sobhani specializes in Internal Medicine and has a reputation for diagnostic excellence and a niche in Concierge and Executive Healthcare. I am so thankful to Zocdoc for helping me find the best doctor. He was extremely patient friendly and spent around an hour with us discussing all the possibilities and made us comfortable. Even the technicians were awesome and supportive. We were so glad we found him. Would recommend him to all my friends over here. Thank you zocdoc.